Discover your passion. Empower yourself. Escape the rat race. Most people are so focused working in their jobs, spending way too many hours working for someone else, that its costing them valuable time away from the people they care about and doing the things they love. Too many people would love to move away from their corporate jobs, but they’re not sure which direction to take as the options seem risky and they’re afraid that they won’t be able to sustain their lifestyles financially doing anything else. Most people don’t have the right guidance and support around them to strategise and plan their corporate escape and this is causing them to procrastinate indefinitely. For the last few years, I’ve worked with and alongside other entrepreneurs who have made the transition out of corporate and are now running their business full-time and winning. I’m going to share the very best of what is working for them in the Corporate Escape AcceleratorTM Intensive. Turn your passion into income. Escape the rat race. Live a life of freedom. 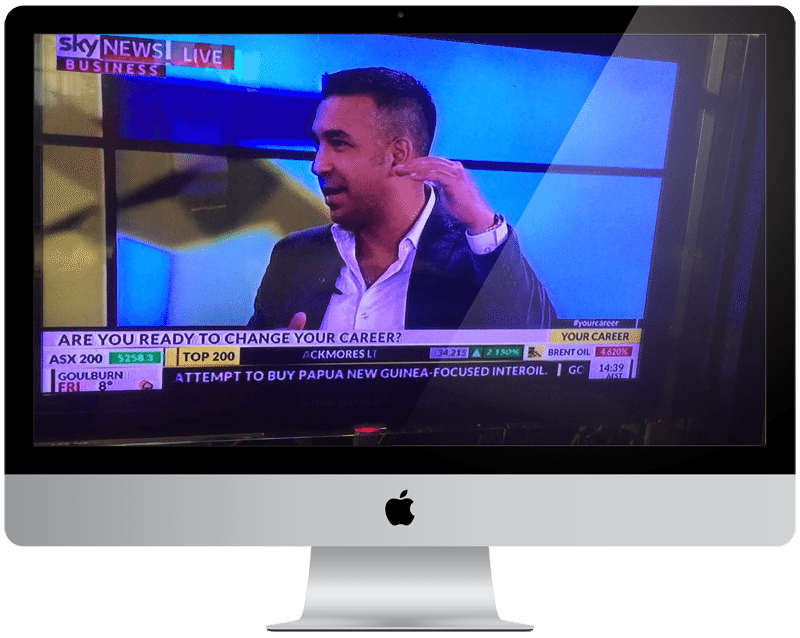 Over the next 6 weeks, I’ll personally help you to confidently step away from your corporate job into a business you are passionate about, so that you can double your income, impact and independence. Simple self-discovery techniques that will awaken your passion and help you to dream BIG. Powerful empowerment tools to grow your mindset and get rid of limiting beliefs. Winning strategies to grow any business aligned to your core values and support your goals. Proven implementation techniques to enable your transition from corporate to become a reality. Leveraged business concepts that will get YOU out of the rat race within the next 6-12 months! In my upcoming 6-week Intensive I’ll show you exactly how to escape the time-for-money rat race, grow your income to suit your lifestyle and experience a personal and financial freedom only the top 5% ever do. Welcome and introduction to the program! Hear the founder Gavin’s story, his vision for what it means to actually break free from corporate and be your own boss. Get a glimpse over the next few weeks into some of the practical education and tools to help you will find useful in the real world as you climb off the corporate ladder to achieve your personal goals. 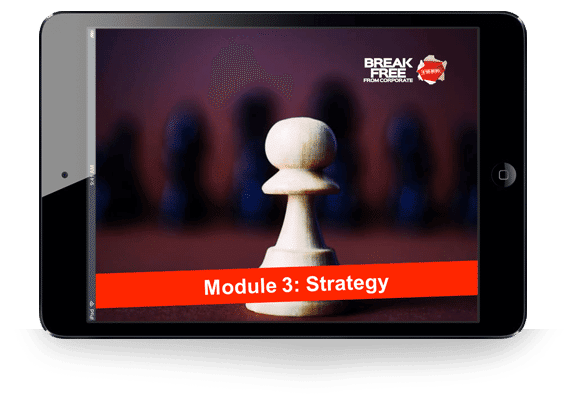 In this module we focus on building a solid foundation and understanding of what makes up your core strengths and weaknesses. We explore what makes you tick and we go deep into defining your WHY, i.e. the core reason that drives you each day. 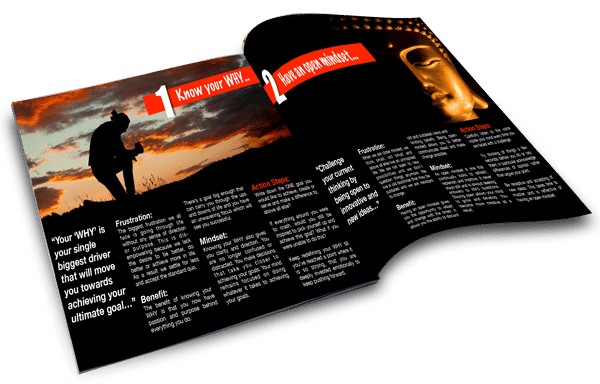 This is massive eye opener and will help you set yourself up for success. 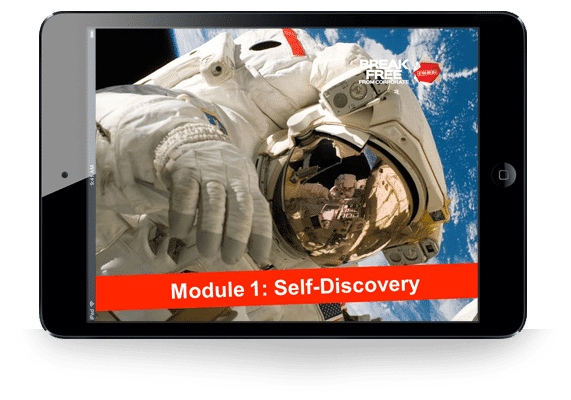 This module challenges your core belief systems that govern your thinking and way you live your life. 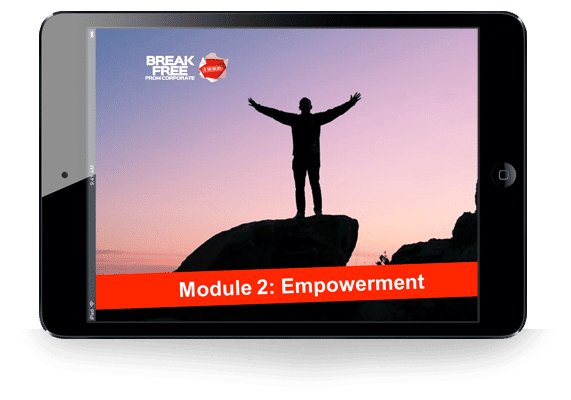 We explore ways in which you can strengthen, challenge and even change certain belief systems so that you gain the confidence to get out of your comfort zone and start achieving more. 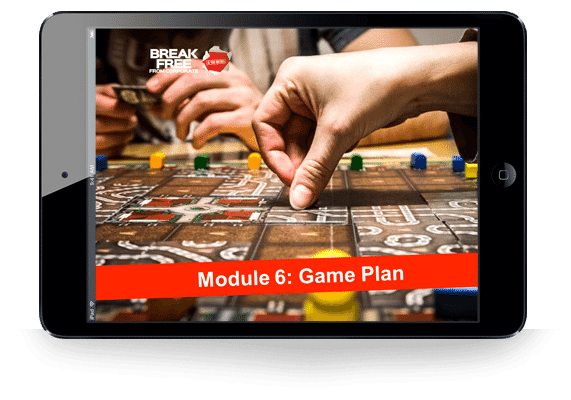 The focus in this module is to define your Vision for what you want to achieve over the next few years and develop a rock-solid Plan to get there! We examine proven methods to help you get this right so that you stay focused on moving forward along your path. This is a crucial week where the rubber hits the road and all the brainstorming is now done. This is where stuff needs to get done! We showcase clever and practical ways to take actionable steps as you begin to execute your plan. This is not a race, its a journey and we look at all the pitfalls and how to easily navigate around them. 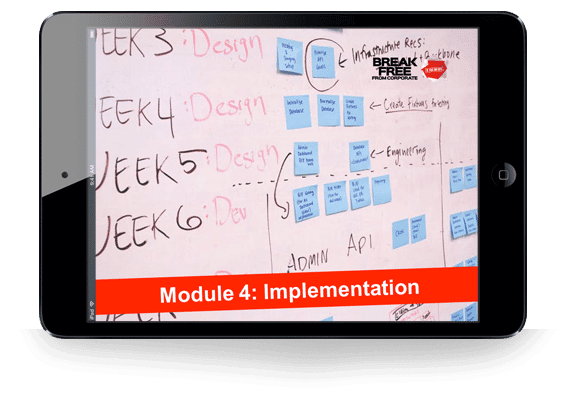 In this module we look at ways to build your new business by working smarter not harder, leveraging around technology, systems and people skills. The 21st century demands that we work in leveraged capacities and this will be a great insight into the many ways you can achieve this. This final week will bring it all together as we look at what we have achieved so far and how we move forward with a strong mission. We look at how to always be ready and on the lookout for opportunities. We also look at how to successfully ride the waves of ups and downs as you go forth on this amazing journey. 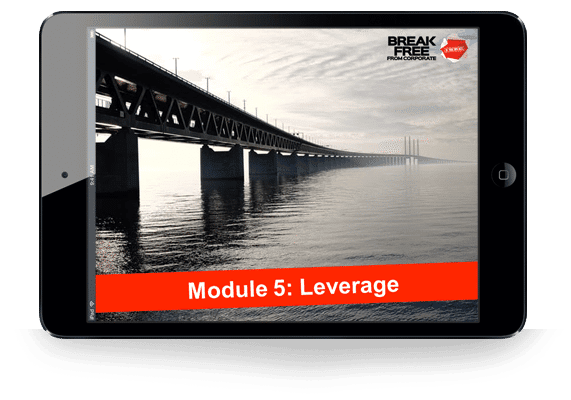 This is your opportunity to get access on a call with me and really get the help you need on the current or previous week’s modules and exercises, so that your questions are answered and you are rocking it as you move forward! This is not a casual think tank, but a highly focused, tightly-knit group of soon-to-be entrepreneurs where you’ll find loving support to EVERY hangup you have in your journey. Get an extra set of eyes on every move or step you take. Quickly troubleshoot any hang-up in a matter of minutes so that you don’t get stuck. Crowdsource your ideas and decisions. Form valuable friendships (and partnerships) that can lead to affiliate opportunities and much more. If you find yourself nodding along with any of the following, then you are in a perfect position to enroll in The Corporate Escape Accelerator™ Intensive and plan the next stage of your journey! You are sick and tired of putting in so many hours in an environment that simply holds you back, doesn’t offer you the potential to do the things you want, with the time and financial freedom you crave so much! You KNOW that getting out of corporate and starting your very own business IS your next big move, one that will create more freedom, impact and income, but have run into false starts every time you’ve tried to do it. You truly feel that you have something unique to offer that simple needs to be nurtured and allowed the right space to grow, and you refuse to watch another year pass you by whilst others make their dreams come true and you’re still stuck wondering. You’re ready to roll up your sleeves and do the work. In fact, you’re totally excited to put in the time, knowing that every action you take from here on, brings you one step closer to escaping the corporate rat race once and for all! You’re willing to zero in and focus FULLY over the next 6 weeks, knowing that your journey beyond the corporate world will be soon much more real and achievable, once you actually have a clear and concise plan that you can implement to. You don’t mind having a bit of fun every now and then – and welcome the idea of engaging with a passionate community of like-minded entrepreneurs. So if any of the above resonates, then I can’t wait to welcome you to The Corporate Escape Accelerator™ Intensive and reward your commitment with the most COMPLETE implementation program of its type available.